Piyush Goyal, Union Minister of State (IC) for Power, Coal and New & Renewable Energy has said that that the primary objective of the Government’s thrust on energy efficiency investments is to promote sustainable development and to improve energy access at affordable prices to the people of India. Shri Goyal is on a visit to Tokyo to attend the 8th India-Japan Energy Dialogue. The Joint Statement issued following the conclusion of the Energy Dialogue chalked out a clear roadmap for further collaboration in the fields of electricity, renewable energy, energy efficiency and conservation, coal and petroleum and natural gas. While on visit Shri Goyal informed that the use of energy efficiency measures as well as promotion of cleaner and renewable sources of energy in India is a step forward. He also underlined the fact that as Nation, we are is trying to reduce dependence on imported fossil fuels while simultaneously adopting advanced technologies to address its developmental priorities. Goyal urged the Japanese and Indian industry to come out with innovative technologies that could serve the needs of the common man - particularly for unserved sections of India where electricity grid is yet to reach. The Minister stressed on the importance of promoting energy efficiency in agriculture sector where more efficient pumps could replace the existing inefficient ones leading to savings on energy, better technology to the farmers and benefit of financial saving to the states of India. Shri Goyal invited the industry to implement energy efficiency projects in a manner where a comprehensive package is provided to the consumer, starting from the energy audit to the implementation. 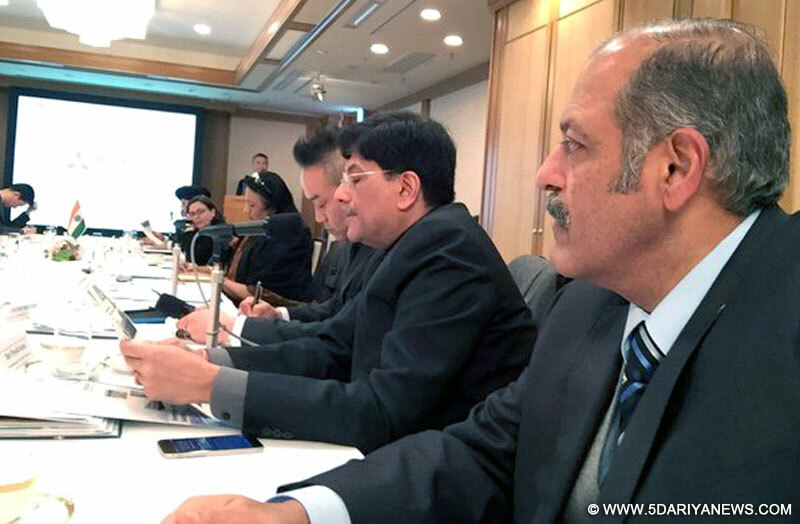 Goyal attended three roundtable conferences on Wednesday morning on Clean Coal Technologies and Efficient Coal Based Power Generation, Super-Efficient Appliances & LEDs and Energy Efficient Petroleum Refining- Energy Audit in Refineries. He also participated in two roundtable conferences held on the theme of Energy Storage Technologies and Smart Grids/Smart Meters today morning . It was decided to carry out a study to ensure cost competitiveness of technology by working out incremental cost vis-a-vis reductions in pollution emissions to ensure power generation at affordable rates. Detailed discussions were held on Kobe Steel’s engagement in taking up Upgraded Brown Coal Technology (UBC) for upgrading lignite from Neyveli. A delegation of about 30 top Indian businesspersons is accompanying the Minister. This is in addition to PSUs like Indian Oil, Hindustan Petroleum, IREDA, NTPC and others. Japanese companies participating in the meetings include Toshiba, Hitachi, Sumitomo, NEC, NGK, Omron, Mitshubishi, Fuji,Yokogawa, Toyo, Panasonic and others. Besides their participation in sessions dedicated to priority energy areas, an Investors’ Roundtable Dinner was also held. The Minister also participated in a roundtable seminar at the Institute of Energy Economics of Japan (IEEJ).